Join us at the reception on 8 May 2017 @ 5:30pm and meet the artists. Langara Campus - in the library concourse. 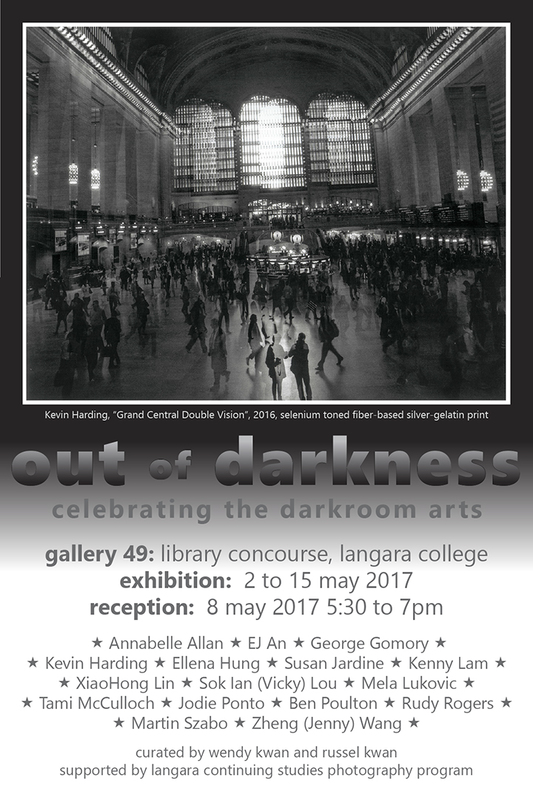 Exhibition runs 2-15 May 2017, open all campus hours. Basic Darkroom is your foundation course for all of the darkroom arts and sciences. Working under amber safelights, you will experience the magic of black and white photographs emerging from the darkness before your eyes. The main goal of this course is to get you entirely safe and self-sufficient in the black and white darkroom – from shooting film to efficient work habits to mixing chemistry to processing film to handling enlargers to printing, toning and finishing your photographs – it's all here. With diligence, you will finish this course with better-than-lab quality mounted black and white prints and the confidence to continue working in the darkroom on your own. An added benefit: by week 4 you should be self-sufficient enough to use the darkrooms during Open Studio on Sunday afternoons. You must have a film camera (35mm or 120 medium format) and a light-meter (in-camera is best!) for this course – please bring them to our first session. This second course in the black and white darkroom focuses on producing fine-art quality prints in the gold-standard medium of black and white photography: archival fiber-based silver-gelatin. Along the way, you will learn how to influence and control the structural and tonal qualities of your negatives and prints by thoughtfully choosing and manipulating films, papers, developers and toners – these tools are the keys to the myriads of undiscovered looks and styles possible within the black and white medium. Diligent students will finish this course with gallery-quality mounted prints – the entry point for an exhibition career. Basic Darkroom or recent experience with photo chemistry, film processing and colour head enlargers are prerequisites for this course. If you have completed Basic Darkroom at Langara, you may use the darkrooms during Open Studio on Sundays, starting Week 1 – otherwise, you must satisfy your instructors with your competence before being granted this privilege. You must have a film camera (35mm or 120 medium format) and a light-meter (in-camera is best!) for this course. The prerequisite courses "Basic Darkroom" and "Practical Darkroom" lay the foundations of best practices and techniques to produce high quality photographic silver gelatin prints. "Advanced Black and White" concentrates on taking those same materials far beyond their design boundaries and perhaps far beyond photography. In a highly experimental environment, you will take charge of your materials, and in combination with your personal aesthetic, and with just a little luck, you will transform your ingredients from basic materials to art medium. Your results may no longer be recognizable as photography, but they will be instantly recognizable as art. The exact path you will take is not pre-determined – the combinations of techniques and ideas are truly endless. We'll explore physical and chemical photographic phenomena together in a directed, but truly experimental manner, so your final destination is unknown – but wherever you go, there you are.